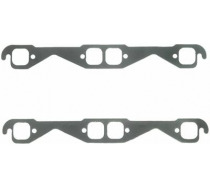 These Fel-Pro Performance exhaust header gaskets are made from high-temperature, high-density fiber material around a perforated steel core, for durability and heat resistance. They're pre-coated for easy removal. Port Height (in) -- 1.500 in. Port Width (in) -- 1.500 in. Notes:Will to fit factory style Vortec cylinder heads.